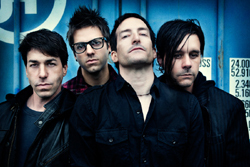 Richard Patrick is founder and frontman of the band Filter. He also formed the supergroup, Army of Anyone with the DeLeo Brothers, Dean and Robert, of Stone Temple Pilots, and drummer Ray Luzier. The first Filter album was released in 1995. The current album “The Trouble With Angels” features tracks busting with honesty that has became a sort of Filter signature. We caught Richard Patrick and asked him a few questions. Maximum Ink: What do you think led you to become a musician? Richard Patrick: The first thing every musician realizes is that they appreciate music more than others around them. There is always a great song out there, you just have to find it; or write it yourself. MI: Did you ever want to be anything other than a professional musician? RP: If I wasn’t a musician, I’d probably be acting. I feel like there is another side of me that I am not wholly tapping into and being around a camera and taking direction for our music videos makes me think it’s something I should get into. RP: Neil Diamond, Eddie Van Halen, Skinny Puppy and U2. I love music and I listen to as much of it as I can. MI: When describing the track Drug Boy off of The Trouble With Angels you mention that as a kid “trip out on whatever and just walk around the graveyards of Cleveland”. Graveyards are rather..peaceful:) Do you ever miss those days?If you don’t mind my asking what was that like? What did you learn from all of that? Any advice to today’s youth in regards to that? RP: Of course I miss those days running around without a care in the world, but everyone has to grow up sometime. Now I have an amazing time living and seeing my children grow up. MI: How does the album Trouble With Angels differ from past Filter albums? RP: The record before The Trouble With Angels was Anthems for the Damned and was a tribute to the soldiers who fought and died in Bush and Cheney’s war in Iraq. It supported the troops but protested the war so the album was a huge departure from my previous works. This new album is the classic Filter sound, like Title of Record and Short Bus. MI: Can you tell us a little about the song, Absentee Father? What led you to write that? RP: I’d like listeners to use their imagination and think through it. Take what you can from it and come up with your own conclusions. MI: How has your outlook on life in general changed most since you yourself became a father? RP: I am no longer thinking of myself. I now have these two beautiful babies that rely on me and my wife for everything. its wonderful. MI: What was it like to form Army of Anyone? RP: Robert, Dean, Ray and I had a great time in AoA. We made a great record and toured the States. It was a lot of fun. MI: Where can fans go for the latest information? RP: Fans can visit our website, become our friends on facebook, myspace and follow me on twitter for all the latest news on everything Filter.